The Suprascapular Nerve is the nerve to the Rotator Cuff. The Suprascapular Nerve runs in the back of the shoulder, where it can be pinched, or compressed. Suprascapular Nerve Compression has been called the ‘Carpal Tunnel Syndrome of the shoulder’, although it’s nowhere near as common. Suprascapular Nerve Compression causes pain in the back of the shoulder, as well as weakness and eventually atrophy of the Rotator Cuff muscles. Atrophy means that the muscles turn permanently to fat. The diagnosis of Suprascapular Nerve Compression is often missed because it’s not that common, its symptoms can be subtle and its symptoms overlap those of the far more common Rotator Cuff Tendinosis and Rotator Cuff Tears. However, once the Rotator Cuff muscles atrophy, the damage and weakness may be permanent. The diagnosis of Suprascapular Nerve Compression is obtained by a Shoulder or Upper Extremity Surgeon’s physical examination and a nerve conduction study/EMG. Suprascapular Nerve Compression can be due to compression under one of two ligaments: the Transverse Scapular Ligament or the Spinoglenoid Ligament. This is similar to how Carpal Tunnel Syndrome is caused by compression of the median nerve underneath the transverse carpal ligament of the wrist. Suprascapular Nerve Compression may also be caused by a ganglion cyst originating from a SLAP (labral) tear in the shoulder joint. If the Suprascapular Nerve Compression is caused by a ganglion cyst, it can be effectively treated by arthroscopically repairing the SLAP lesion; details of this are provided in the “SLAP Lesion” section of this website. In these cases, the ganglion cyst itself does not usually need to be removed; repairing the SLAP lesion resolves the ganglion cyst and cures the Suprascapular Nerve Compression. If Arthroscopic Suprascapular Nerve Decompression is performed as an isolated procedure there are no formal post-operative restrictions. Activities are limited only by pain and discomfort. After surgery, keep the arthroscopy portals (stab wounds) clean and dry for 24 hours. Before 24 hours, bathing is fine; just keep the shoulder above water and don’t get the dressings wet. After 24 hours, the wounds can get wet in the shower, just blot them dry. Don’t submerge the wounds under water until the stitches are removed, which usually occurs at the first post-operative appointment after 2 weeks. The elbow, wrist, forearm and hand can all be moved early on, to prevent stiffness. 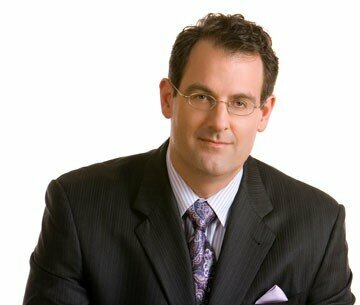 During Shoulder Arthroscopy, fluid is placed into the shoulder. This fluid will leak out over the first 2-3 days, and is not blood.. In summary, Suprascapular Nerve Compression is an often over-looked cause of pain, weakness and permanent Rotator Cuff muscle atrophy in the back of the shoulder. Fortunately, Suprascapular Nerve Compression can now be effectively treated arthroscopically on an outpatient basis. 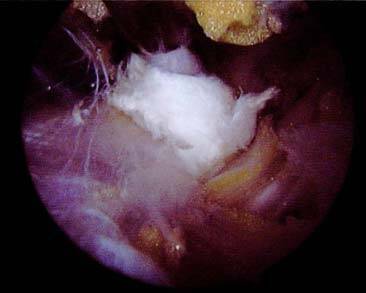 Arthroscopic View of the Needle About to Cut the Transverse Scapular Ligament. 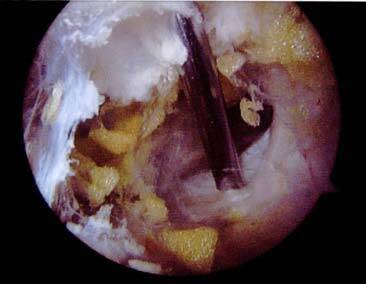 The Transverse Scapular Ligament is the Off-White Horizontal Structure that looks like a Fence Immediately Behind the Needle (the Vertical Long Metal Object in the Center of the Photograph). The Transverse Scapular Ligament (the White Structure That is Now Flapped Back) has Been Cut and the Suprascapular Nerve (the Yellow, Cord-Like Structure Behind the Cut Ligament) is Now Decompressed.